One of my readers suggested I put the date on my posts and I thought that was a good idea. Sorry I hadn’t thought of it earlier. As I’ve said, I boarded the ferry from Skagway and took my truck with me to Haines where I left it. I continued on the ferry to Juneau since you can’t drive to Alaska’s capital. It’s either fly or take the boat. There are two basic ferrys within the Alaska Marine Highway system. The slow ferry and, I believe, one fast ferry. 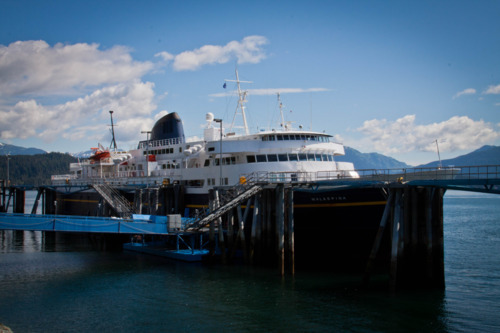 The ferries run from Bellingham, WA to Kodiak Island and just about everywhere in between. 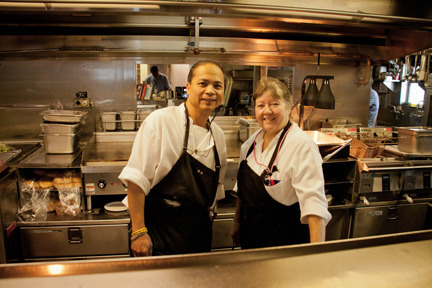 The slow ferries have cabins, a liveaboard staff, a car deck and a galley. I had a great breakfast on the slow ferry from Haines to Juneau. The fast ferry doesn’t have a galley but more of a convenience store approach of pre-packaged sandwiches, desserts, etc. Still good but not cooked to order. This is the M/V Malaspina. It’s the slow ferry I took from Skagway through Haines to Juneau. 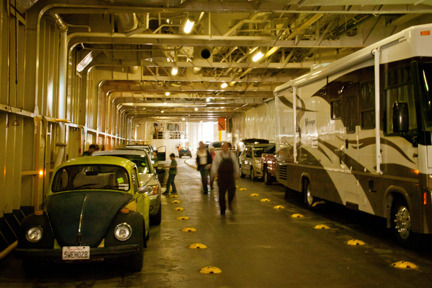 The car decks hold about 35 vehicles. Once it’s onboard you can’t access it unless your are in port. Pets have to be left on the car deck. You can bring anything on board from a bike to a motorhome. Only the charges change. The forward lounge is very comfortable with windows all the way around. 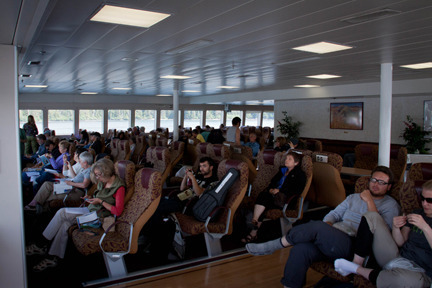 This is the lounge on the fast ferry. The one on the slow ferry is pretty much the same. The fast ferry is newer. THere is also a Ranger onboard giving short talks on the ports, whales and other sights along the way. After arriving in back in Juneau after my whale-watching trip to Gustavus I took the ferry to Sitka. While in Skagway, I met a young guy from North Pole, Alaska (10 miles from Fairbanks). He’s a drafting and welding teacher at the high school there. His wife works with disabled kids. Anyway, Mike was staying at the same campground I was at and we got to visiting. He was on his way to Juneau for a three-week class to finish his Masters. He had his truck with him. One of the disadvantages of the ferry system is that they don’t usually come in near town. In Skagway, they docked downtown but in Haines it lands about 5 miles from town, in Juneau it’s 12 miles and in Sitka about 8-9 miles. Buses don’t run to the ferry terminals either so either you take a cab ($40 in Juneau to town, $30 in Sitka) or someone picks you up or you have your own vehicle on board. Mike had his truck on board and we teamed up for a day of sightseeing. Since we were going to the same places it worked out great. 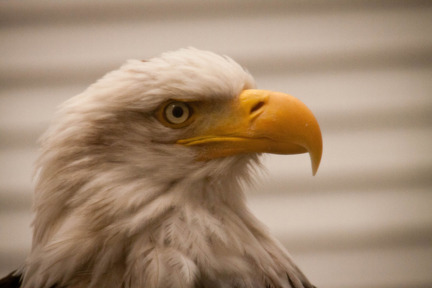 The owl and eagle were shot at the Sitka Raptor Center and the bear at the Fortress of the Bear. 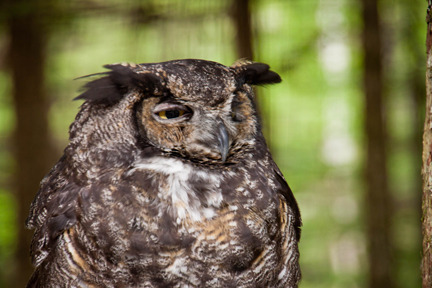 THe raptor center rehabilitates birds hit by cars or hurt in some way. The homeless bears (?) 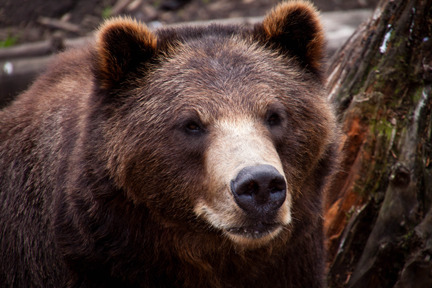 spend time before ending up at your local zoo. Mike saved my about $150 in taxi fares. I treated him to lunch one day, dinner in Juneau and gave him a little extra cash. It was well worth it. I’m in Homer today having lunch with a fellow alumnus of Girard Rural High School in Girard, Kansas. I’ll pick up the story from here next time. Have a great day! I am!